Welding involves a wide range of tasks and a wide range of health and safety hazards. Burns are the most common hazard and injury for a welder due to sparks and molten metal fragments landing on the skin. More than 25% of all workplace accidents involve hand and finger injuries. Work-related burns account for 20-25% of all serious burns requiring hospitalization. 70% of employees with hand injuries reported not wearing gloves at the time of the injury. Protective Welding safety gear is just as important as the equipment you are welding. The two most important things to protect for a welder are his eyes and hands. That is why it is essential to wear the proper welding safety gloves and the best welding gloves you can find. The best welding gloves protect your hands from exposure to sharp metal edges, jagged surfaces, red hot metal, sparks and other hot flying metal. Gloves can also protect hands from the ultraviolet radiation that is emitted in arc welding. By Gregory Sanders: This article has been updated to reflect the most accurate information regarding welding gloves available for those who are interested in welding protection gear. The best 6 available have changed, and information has been added to assist individuals in finding the best gloves for welding currently available on the market. The FAQ has also been updated. This unit does not come with a spool gun. If you plan to mount this welding machine on a cart, take care because the gas hose connection can interfere with the tank. While the TIG and stick functions work fairly well, operators have stated the plasma cutter has difficulty starting the pilot arc. Some have reported that they were only able to get it to cut up to 3/8 inch thick despite manufacturer claims that it can handle ½ inch. These welding gloves are 21 inches long and will protect from fingertips all the way up the forearm. Extra padding and reinforcement at the wrist and palms protect against heat, sparks and splatter. Special strap prevents the gloves from slipping down while working. Designed for overhead, stick and plasma welding. Gloves are not suiting to work that involves small, precise movements and fine detail. During welding and cutting operations, having the best welding gloves for the job enhances your welding speed, ability, and safety. Most employers will make sure welding operators are wearing the best protection for the welding operation in order to reduce injuries and downtime and ensure optimal performance. Must provide sufficient hand coverage and be made of suitable materials to minimize skin burns, ideally leather or flame resistant materials. Just as important is the fit and comfort. If the protection is comfortable, has a good fit and provides the necessary protection, welders are more likely to want to keep it on. The preferred material for welding gloves is leather, to provide the appropriate flexibility and protection from arc rays, molten metal spatter, sparks, and hot metal. The gloves should be thick enough to not shrivel, burn or get worn out quickly. Various types of leather are used for welding gloves, providing different levels of protection, durability, and comfort. The great level of comfort provided by elk skin does not take away from its heat, flame, and abrasion resistance. It comes in heavier cuts and provides great protection for stick welding. Cowhide is another durable, heat-resistant, and flame-resistant material for welding at high temperatures. It is known for versatility, durability, dexterity, abrasion resistance, and comfort. It is common in MiG welding gloves. The most comfortable fit, along with a lot of dexterity, comes from deerskin welding gloves. Thick deerskin is good for resisting high temperatures, and it provides the advantage of taking the form of your hand over time, which makes it a very comfortable glove option. Pigskin is highly resistant to both weather and oil. 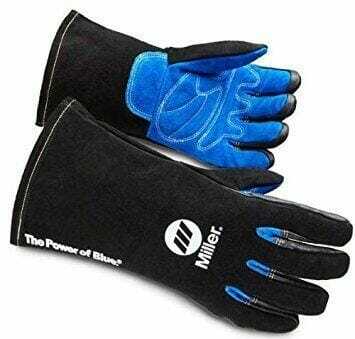 However, it lacks much of the heat resistance provided by other types of gloves. 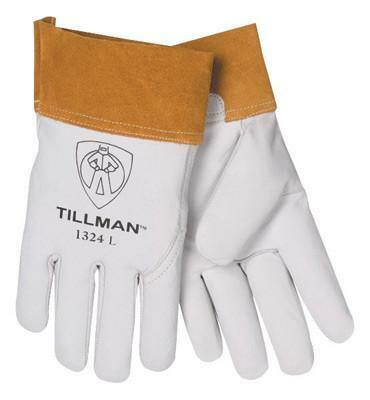 TIG welders generally prefer goatskin gloves. They are comfortable, light and flexible, which is important for picking up and feeding the filler rods. They are also oil and water resistant. The best welding gloves are made from top-grain leather, which is the high-quality outer layer of an animal's hide. Welding gloves balance flexibility with heat protection and will vary depending on the welding process used. Each kind of welding process requires a specific type of glove appropriate for the job. Knowing what your hands will be exposed to helps you in selecting the best welding glove for each application. Stick welding creates the high heat and requires stiff, heavy-duty gloves that can withstand high temperatures. The best stick welding glove options include top-grain pigskin, elk skin, or goatskin. Particular factors in each type of welding mean that gloves also call for special features. For instance, the best MIG welding gloves offer a thick pad at the back of the hand. This is to protect the hand during a typical position where the non-dominant hand is used to stabilize the welding torch. It creates a stable brace and allows more precise control and the ability to find the plane of workpiece more easily. To help get the gloves off when they overheat, MIG welding gloves generally fit loosely. The fingers are more rigid, but it’s not a major factor because most of the dexterity required in MIG welding comes from the wrist. Top-grain cowhide, goatskin, or deerskin are common leather choices you'll find in MIG welding gloves. The best TIG welding gloves are usually made of a softer, thinner leather. At times they may be leather combined with Kevlar or another fire-resistant fabric. Since both palms face the welding tool in TIG welding, there’s no need for the pad on the back of the gloves. These gloves generally fit more snugly and allow more finger mobility. These design factors allow for the more precise control that TIG welding requires for the torch and filler. TIG welding produces the least amount of heat but requires precise movement for precise welds with the TIG torch. A lighter and more flexible glove. 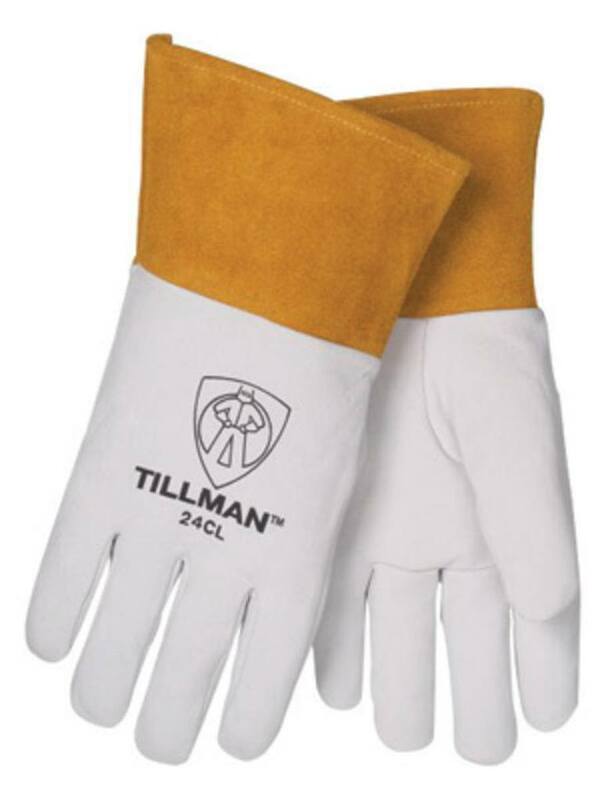 Goatskin leather gloves are quite popular and are typically ideal for TIG and MIG welding. However, Deerskin gloves offer the advantage of shaping themselves to a welder's hand over time and make for an extremely comfortable fit. The whole body must be protected when welding due to the potentially dangerous nature of the craft, and the hands have special safety needs due to their closeness to the welding torch and material being welded. That’s why it’s so important to have a really protective pair of welding gloves, to keep your hands cool and burn-free while you work.